The Crown Jewel of CUTV is our Mobile Production Truck. Our truck is second-to-none in the world of college broadcasting. Featuring new Triax-powered Hitachi SD-Studio Production Cameras valued at over $125,000, the 2008 Dodge Ram 5500 is a studio-on-wheels capable of producing television anywhere at anytime onboard control room mounted behind the 6.7 L Cummins Turbo Diesel engine. A look inside of the CUTV Production Truck. 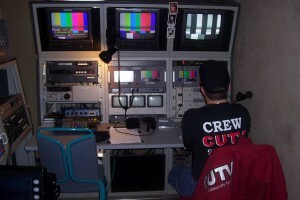 The truck contains independent components used for television production including a COMPIX graphics package, “Crossover” switcher, 1-channel instant replay system, and audio board. Recently added to the arsenal is over 2,500 feet of Triax Camera Cable, providing the possibility to run cameras to places other stations can only dream of. California University Television is proud to be one of the only college television stations in the nation to follow it’s University’s entire football schedule, as well as Men’s and Women’s complete in-conference basketball games, as well as much, much more through the use of the truck. 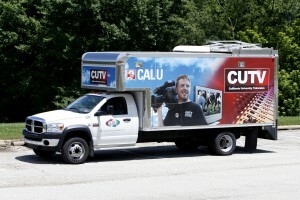 If you want to begin a career in multi-camera production or sports broadcasting, there is no better place to begin than on-location with CUTV and the Mobile Production Truck!